Charity Walk - a superb way to bring people together for supporting charity whilst getting active in the outdoors!!! It is one of the best ways to raise awareness and fund for needy people who are suffering from serious diseases like cancer, asthma, motor neurone disease, etc. Many special events are held every year, providing the great chance to volunteer. Last year various sizes’ walks took place all over the world and many charities have raised a fantastic amount towards taking a step closer to realizing cancer awareness - a World free of Cancer. This popular event is a simple way for anyone to take a part in stomping out cancer. 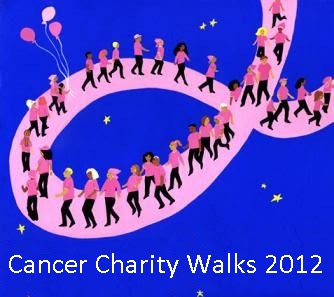 In this article, we tried to mention all the upcoming cancer charity walks of 2012 which will be held all across the World. Nowadays, cancer is the leading cause of death among people. It robs thousands and thousands of people and their families’ laughter and joy that must be a part of everyone’s family. Participating in the Cancer Charity Walks will help to raise awareness among people and funds for charity to support the research and treatment of cancer. Additionally, these walks are a wonderful way to improve your own health. In general, colon cancer is the 2nd leading cause of cancer deaths in both men and women. The Chris4Life Colon Cancer Foundation will held 6th Annual Scope It Out 5K Run/Walk on Sunday, March 25, 2012 at 9:00 a.m. in the heart of downtown Washington. The event will start at Freedom Plaza and will include a picturesque tour of well-liked DC sites including the Newseum, National Galley, Ford’s Theater, U.S. Botanical Gardens, FBI Headquarters, and the Capitol. One great way to boost funding for research and awareness for pancreatic cancer is Pancreatic Cancer Research Events. Lustgarten Foundation Events serve as a superb celebration of the progress being made in the struggle against this disease. It provides food, live music, community expo and fun for the whole family! Your important participation will provide them hope for the future. To join this event, you have to pay minimum registration fee but you can save $5 by doing pre-registration that will cost only $30, while the walk-in registration will cost $35. Prostate Cancer Charity Walk is 3 day walk of approximately 25 miles taking in the highlights of Hadrian's Wall. It is a guided, fully supported walk and the route passes via some of Northern England's most gorgeous scenery and enjoys some of the premium and best preserved segments of the wall. The trip also includes very relaxed accommodation and your luggage will be shipped between accommodations. This walk is appropriate for most of the people. You should be capable to walk numerous hours a day whilst hauling a small backpack but don't require to have any preceding mountaineering experience. The 2012 Avon Walk for Breast Cancer will take place in 9 exciting cities all across the U.S. Though you’ve resided in a place for years, the Avon Walk lets you to experience it in a complete new way, as each Walk route is planned to introduce the best that city has to offer. Select a destination that you always want to visit and spin your Walk weekend into an enjoyable getaway. No matter where you prefer to walk; you can rely on an inspiring journey as you’re fighting breast cancer at each step of the way. To get more info, visit www.avonwalk.org. Mark your calendars for the Heather’s 9th Annual Lung Cancer Walk. It is a 3.8-mile walk/fun run across Jack Curtis Stadium to increase funds for lung cancer research. It will be held on Saturday November 3rd, 2012 at Cooper River Park, Pennsauken, NJ. Free to Breathe Phoenix Lung Cancer Walk was established in honor of Bud VanStechelman. It offers opportunity for lung cancer survivors, advocates and the community to team up to increase awareness and support in the movement to overcome lung cancer. It takes registration fees. 5K Walk - 10:10 a.m.
1.5 Mile Walk - 11:00 a.m. The 3rd Annual Florida Brain Cancer 5k Run/Walk will be held on March 25, 2012 to speed up Brain Cancer Cure's innovative research funding program. Their 5k event has assisted to increase funds for brain cancer research at the University of West Florida, University of Florida, Florida State University, University of Central Florida, Scripps Florida and MD Anderson Cancer Center Orlando. In 2012, Walk 4 Pancreatic Cancer will schedule their 4th Annual Walk for Pancreatic Cancer. Try to bring your friends and relatives and walk in honor of an important person you've lost, for a treat or just meet to walk in hopes of hitting this disease which strikes so radically. Registration for the walk opens in early 2012. Mark your calendars for Saturday May 12, 2012 and forward the date to family and friends! Take a part in the Phoenix Brain Tumor Walk for benefiting the National Brain Tumor Society! Funds increased via this event will help to impel strategic research to discover a cure for brain tumors, and make sure that the critical requirements of the brain tumor community are completed through patient information and public policy. Join the Breakthrough for Brain Tumors 5K Run/Walk on Saturday, May 12, 2012 in Lincoln Park. Breakthrough for Brain Tumors will increase critical funds to prop up imperative brain tumor research and desperately required services for those who are diagnosed with a brain tumor. Whether you’re a walker or a runner, this event is a chance to breakthrough for brain tumors. Making Strides Against Breast Cancer is not just the name of a walk; it depicts the progress they are making together to save lives and stomp out breast cancer. It is unique and special as the story that encourages dedicated walkers, volunteers and donors. Every step you take and every dollar you raise will save lives by assisting people to stay well and get well, by finding cures, and by combating back against breast cancer. Assist the American Cancer Society to save lives from breast cancer. So don't wait, find a walk in a different state, or make a donation at makingstrides.acsevents.org. Is there a Sarcoma Cancer Walk anywhere in Texas? Is there a Sarcoma Cancer Walk anywhere in Illinois? Help people, let's unite for one good cause, be a volunteer"save lives"!